As an educator for 35 years, I have found that the one thing all teachers need to know is their students. If we don’t understand this audience of learners, we will never reach them. I have taught three generations. The two youngest are known as the millennials, defined by the U.S. Census Bureau as those born in the years 1982 to 2000; and the iGens, or Generation Z, who were born in the late 1990s to early 2000s. A 2015 census study indicates there are more than 83 million millennials in America, representing more than a quarter of the population. This trend is magnified in the armed forces. According to the most recent Military OneSource demographics report, about 40 percent of the total military force was 25 years old or younger in 2014, and 21 percent of the force was between ages 26 and 30. These two generations have a deep understanding of technology and how it works. They are easily able to manipulate it and use it to their advantage. They use technology to stay connected to each other frequently, even constantly. Indeed, the millennials and iGens are wired differently than older Americans. As Nicholas Carr wrote in his book The Shallows: What the Internet Is Doing to Our Brains, because of brain neuroplasticity, young people are developing new and different neural pathways through constant use of technology such as mobile devices and the internet. Edutainment, a combination of education and entertainment, is what is most important to today’s students. To reach them, instructors and curriculum developers must leverage that deep understanding of technology by using it creatively and often. Millennials and iGens don’t mind learning but for it to be relevant to them, learning must also be entertaining. If the content and delivery of education is not entertaining enough, it may not be appreciated or valued. The term edutainment was used as early as 1948 by the Walt Disney Co. to describe a series of educational programs that were information-rich, but with entertainment playing at least an equal part to education. Disney was attempting to educate as well as entertain at a time when many other educational products such as filmstrips, movies and other multimedia forms were primarily focused on education and information. Earlier generations of students didn’t really expect education—or work, for that matter—to be entertaining. It was just something that had to be done regardless of how boring it might seem. Gaming and online and instant technologies have changed that for the millennials and iGens. A workshop at Fort Eustis, Va., focuses on the Army Learning Model. The pioneering children’s TV show Sesame Street began in 1969 during the Generation X years. With fast-paced learning involving characters, music and color, edutainment blended with multimedia was born. Learning didn’t have to be boring. Instead, it could be fun for everyone. There was no hierarchical element to Sesame Street’s education. It appealed to high-achieving students as well as those with intellectual or developmental issues. However, edutainment put a huge strain on instructors because they could not compete with the television industry when preparing for lessons on a regular basis. The entertainment industry utilized computer-generated effects, soundtracks, lots of action, and multiple characters or actors who all worked together for delivery of instruction. Also, Sesame Street brought education to the students where they lived, rather than sending children to education centers. TV was able to create virtual realities that were free from many constraints found in the traditional classroom. Meanwhile, the existing school model approached education using a factory system: Centralize learning in one place, divide students according to age and abilities, provide them with a single educational leader with all the answers, and deliver education from the top down. Today’s students seem to appreciate informal learning situations rather than formal classrooms. In the change toward informality, learning through entertainment created a more passive role for students. Instead of being forced to learn, learning happened almost through osmosis. In an informal setting, the barriers to learning came down; students were sometimes not even aware that learning was taking place. Like it or not, education had a new model. The ultimate consequences of the model were that now, education value was not just in what was being taught. It also had to have entertainment value. The edutainment industry has rapidly changed with the advent of new technologies and is continually adapting. These new technologies cater to the worldviews and preferences of the millennials and iGens. Teachers must remember that these worldviews and preferences impact the way these generations learn and assimilate information. Recognizing that reaching the youngest generations requires a paradigm shift, the Army has created the Army Learning Model. It calls for a learner-centric environment that employs the use of scenarios, simulations and gaming as well as other learning strategies. It attempts to turn the traditional classroom into “collaborative problem-solving events.” It utilizes the existing knowledge and skills that each individual possesses, and leverages them so all students can gain from those individuals. Ultimately, the model increases student buy-in to any curriculum, and puts the onus of learning on a student rather than on instruction itself. In writing curriculum, and in delivering instruction, there needs to be a continual connection of how it is relevant personally at that moment. If information provided through instruction is not relevant at the moment, students can go online and look it up when it is needed. There is no point in storing irrelevant information when it is easy to retrieve almost immediately. Curriculums and instructors must help identify the “now” relevance for their students. They must inform the students how they can use the material currently, and why they must know and remember it. A 2014 Psychology Today article called “The Beat (Up) Generation” explored the feedback and approval required by many millennials and iGens. These students are constantly reconstructing themselves based on immediate feedback on their performances in a schoolhouse or on the job. This is paradoxical in that they tend to value their independence and free thinking, yet they demand instantaneous feedback on their progress. If they do not get the validation they require, they will move on to someplace that will give them instantaneous feedback. This lack of anchoring can be difficult for instructional development and delivery because there are no guarantees these people will remain in a single place long enough to be consistent contributors. It makes it more difficult for instructors to form long-term relationships with these types of students. The sense of immediacy also contributes to another characteristic of these groups. They do not tend to think long term, and often lack strategic critical thinking. Decisions are made quickly with little thought going into the long-term effects of that decision. Although millennials and iGens may be very goal-oriented and even have high expectations concerning those goals, the goals are primarily for the short term. This kind of thinking interferes with the ability to envision long-term consequences or make plans for the future. This way of thinking also has immediate implications for instructors, who must continually remind students of long-term assignments and note there are likely to be strategic or long-term consequences to decisions. Curriculum writers need to make continual connections from the present to the past to show how past events and learning apply to what is happening in the present. 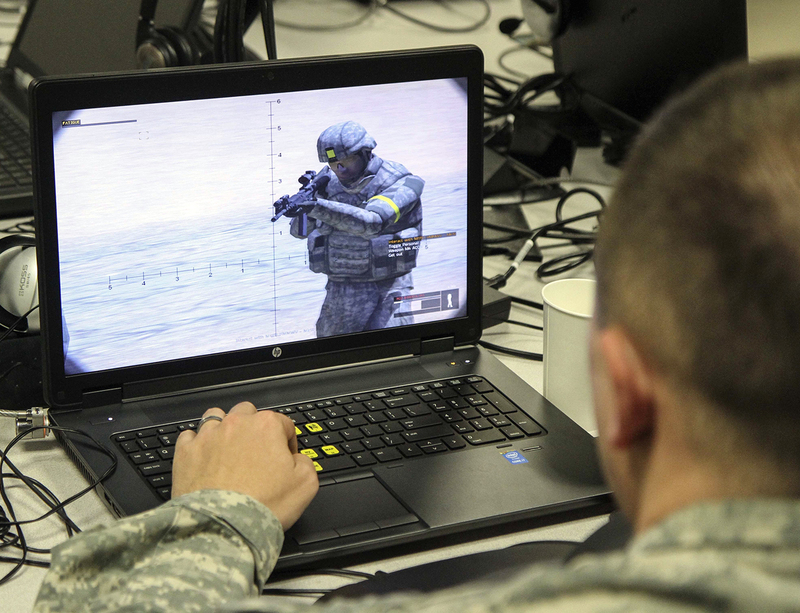 A soldier uses a video game for training. Jeff DeGraff, an author and professor at the University of Michigan’s business school, identifies one of the key generational characteristics of millennials and iGens as tending to see the world through a horizontal lens or in egalitarian terms. To them, everyone and everything is equal. Previous generations typically saw things from a hierarchical (stratified) or vertical perspective. Perspective controls how each generation tends to share and use information. The egalitarian view embraces the benefits of sharing ideas and collaborating to solve problems. The mantra would be to work smarter rather than harder; why waste time striving as individuals when solutions are more easily found through sharing? In contrast, older generations may be more likely to share information based on social position or a need-to-know basis. The hierarchical worldview embraces the notion of the rugged individual working hard and alone. This unique difference accounts for the newer generations putting a priority on problem-solving and thinking in groups rather than working as individuals. Paradoxically, although very group-oriented and willing to share knowledge, there is still a desire to succeed individually and to be recognized for personal achievements. This will mean a major strategy change when designing instruction and assessments. Activities and assessments must be designed and delivered to incorporate this trait without sacrificing the standards of performance for the individual student. This is not easy work. In Generation iY: Our Last Chance to Save Their Future, author Tim Elmore outlines generational characteristics. One of note is a sense of immediacy. Immediacy drives these generations. This is not just a U.S. characteristic but is also seen worldwide, as noted in a recent study published in the Australian Sociological Association’s Journal of Sociology. These generations are the digital, and they live in a digital world. Communications are instantaneous and worldwide. As a result of this technological innovation, these generations do not have the same sense of time as previous generations. They only know what is happening now; what happened in the past is no longer relevant because it is not immediate. It is harder for these generations to find relevance in old data, old ways or anything seemingly outdated. What impact does this have for development of education or curriculum, or for the delivery of instruction? Also, the millennials and iGens are often referred to as perpetual adolescents. One need not look further than the entertainment industry for an indication of their adolescence. There has been a rise in the number of cartoon TV shows and films aimed primarily at the millennials and iGens. With Xbox, Nintendo and PlayStation, they have been accustomed to playing games involving media for hours. Using gaming through technology as an instructional tool is more important now than it has ever been.